HomePT Maccaferri Indonesia actively participates at the ina-igs Geosintetik Indonesia 2016 Conference. PT Maccaferri Indonesia actively participates at the ina-igs Geosintetik Indonesia 2016 Conference. PT Maccaferri Indonesia is collaborating for the organization of the Geositetik Indonesa 2016 Conference and presenting a technical paper. Maccaferri has been an advocate of geosynthetic solutions, such as ParaLink geogrids—unique planar structures consisting of a monoaxial array of composite geosynthetics strips. In many construction projects including soil retention and stabilization works, geosynthetic technologies and systems have been applied successfully as an alternative to conventional methods of construction, taking advantage of all geosynthetic functions, including separation, filtration, stabilization, reinforcement, containment and for use as barriers. The Government of the Republic of Indonesia has planned major programs of infrastructure development, partly under way and partially scheduled for the future. It is certain that geosynthetic technology will have an important role to play in solving many geotechnical problems. Maccaferri Indonesia has chosen to sponsor the Geosintetik-Indonesia 2016 conference at which it will hold a speaking session and present a technical paper. 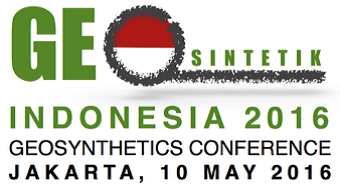 The Geosintetik-Indonesia 2016 conference is considered the most important and renown geosynthetic events in Indonesia. The conference aims to provide information about the most recent developments in geosynthetic technology for infrastructure projects from around the world. An essential purpose of this event is to create a forum for information exchange between end users of the technology and providers. The event also gives an opportunity for end users to share their experience of the benefits and performance of geosynthetic solutions which have been used in their projects. This becomes increasingly important, because it is expected that geosynthetic methods and technology will be used to solve many more geotechnical problems in infrastructure projects in Indonesia, so it is vital that these techniques are well understood and used appropriately. Maccaferri Indonesia will have an exhibition booth at the conference. They will present a paper on “Calculation theory to design earth structures reinforced with polymeric and metallic reinforcements using Limit Equilibrium methods”. The paper describes a calculation theory to design MSE walls/slopes using Janbu and Bishop modified Limit Equilibrium methods. It further describes how to include planar reinforcements into the LE formulations for the global stability and internal stability checks. Moreover, the procedure to properly calculate the long-term tensile strength of the planar reinforcements to be used in the LE formula will be presented. Maccaferri Indonesia invites you to attend the event and looks forward to seeing you in Jakarta the 10 May 2016.